*Disclaimer* Whilst I am a Dell EMC employee this is my own take around the announcement and technologies whilst utilizing resources available to me as an employee, this posting has not been reviewed nor requested by my employers and whilst I plan to give as factual information as possible nothing mentioned below can be deemed fully verified. As I promised during my first posting about the Dell IQT announcements I am planning to cover my own perspectives around the announcements and try share information about it as I learn it myself. 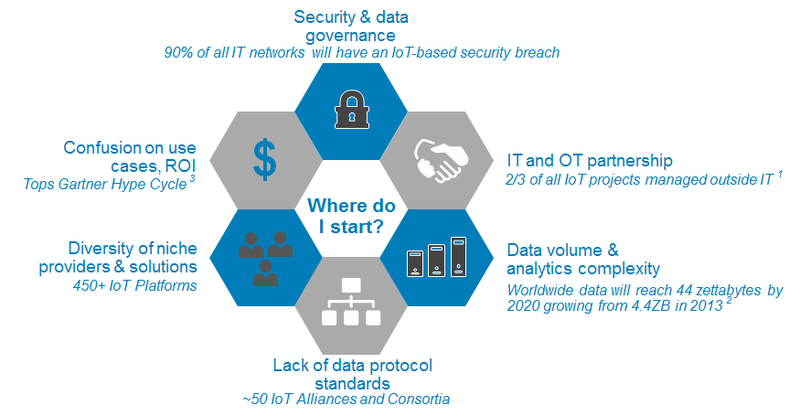 For this second part I am planning to cover why you would choose Dell Technologies as your IoT solutions provider/partner. 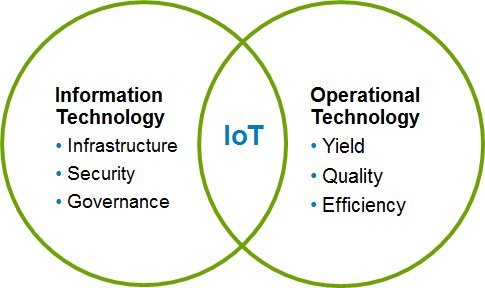 The value of IoT is at the intersection of IT (information technology) and OT (operational Technology). Most of the net new data coming from the 50 billion connected devices that analysts are predicting will be in operational environments and IT will need to work with OT to securely access this data and integrate it with existing IT data and systems to create value. Working together, IT and OT organizations must join forces, using the strengths each has to offer. OT must find ways to gather, analyze and move this data to where it delivers the highest business value whether that be the device, the fog or the cloud. Dell has been unlocking human potential for over 30 years with their computing technologies – Their mission in IoT is to unlock potential of the unconnected by bridging IT and OT. The idea that IT and OT will need to converge for IoT to be successful is pretty prevalent in the industry today but most companies will stop there. Dell has 30+ years of IT heritage and they have been focused on the tenant of security and manageability, but Dell has also been customising their technologies for OT environments for companies like Honeywell, Emerson, and Johnson Controls through their OEM business for over 15 years. Finally their best-in-breed partner program delivers vertical specific OT expertise. Dell is also 100% focused on Industrial/Commercial IoT where they believe the real progress is being made. IT and OT partnership: Lack of CIO and business stakeholder alignment derails strategy development and implementation.2/3 of all IoT projects are managed outside of IT. Lack of data protocol standards: Lack of protocol standards complicates cross-domain data sharing. The true benefit of the IoT is realised through the integration of the core elements. New devices, applications, networks interacting with fragmented and immature technologies and vendors, each using proprietary, non-standard technologies, make the required interoperability between the systems and applications a complicated problem to solve. Organisations considering IoT projects are relying on vendors with proven experience engineering and integrating fragmented vendor and technology ecosystems to lead the way. Diversity of niche providers & solutions: The diversity of start-up, niche providers with immature solutions adds complexity and risk in deploying an end-to-end solution. Confusion on use cases, ROI: Hype obscures real opportunities, causing confusion about use cases, outcomes and ROI, what are they trying to measure and what problem data do they need to collect and how to move forward. 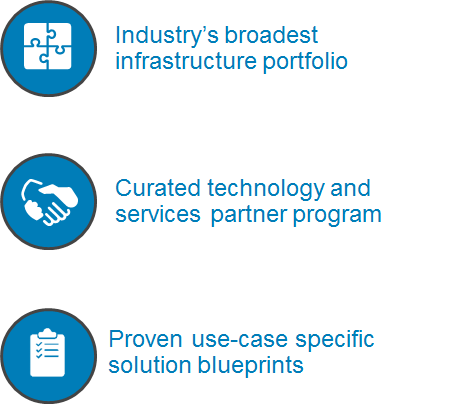 With the industry’s broadest IoT infrastructure portfolio together with Dell Technologies ecosystem of curated technology and services partners, they cut through the complexity and enable you to access everything you need to deploy an optimised IoT solution, and by working with these partners they provide proven use-case specific solution blueprints for a faster ROI. Dell Technologies have successfully developed award-winning edge computing solutions to help customers securely access and analyse data in operational environments, complementing their trusted data center computing solutions. Now with the added assets from the EMC Federation, they are solidifying Dell’s IoT market leadership by providing choice and flexibility and helping you speed up your IoT deployments with a comprehensive infrastructure portfolio from the edge through the fog to the cloud. Dell Technologies ecosystem of curated partners in their best-in-breed partner program, cuts through the complexity and enables you to access everything you need to deploy an optimised IoT solution. 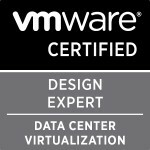 Their hardware and software technology partners and systems integration partners deliver the vertical expertise on top of the trusted Dell infrastructure offering. A + B = C here! By leveraging their comprehensive portfolio and working with these partners they provide proven use-case specific solution blueprints for a faster ROI. Because Dell Technologies do the work to curate the best partners for your use case and validate the solution they can offer a reference architecture to work from which optimises your implementation. Dell Technologies have invested time and money to find these partners on your behalf. For my next posting I am hoping to cover off Dell Boomi as I promised I would in my first posting. If you want to learn more about Dell IoT and IQT then have a look here. Categories: Dell, EMC, IoT | Tags: Dell Technologies, IoT, IQT, IT, OT | Permalink.